After the release of the GTX 1080 TI, it seemed like the war between the Graphics Card People and the Monitor People was over. Finally, after years of trying, General Nvidia had produced a single graphics card capable of sixty frames a second at that mighty 4K resolution. But the Monitor People didn’t take that defeat lying down… and now, Acer’s Hellforges have produced a new secret weapon: a 4K monitor that runs at 144 Hz. In whispers, folks call it the Predator X27; they say that no single graphics card can best it. The X27 hasn’t yet arrived at the front lines, but scattered sightings and hearsay paint a fearsome picture. Dispatches insist it has an IPS panel that will provide blinding HDR colours through powerful quantum dot technology. These tiny particles allow for increased brightness and therefore higher dynamic range, making them an obvious inclusion in this next-gen monster. Sources inside the Monitor People Allied Army say that a Nvidia G-Sync chip lurks inside each X27, adding hundreds of pounds to the cost but ensuring smoother performance even at low frame rates. There have even been unconfirmed reports that the monitor can even see you, with Tobii eye tracking, uncannily following your gaze to shift your in-game viewpoint… but that surely can’t be true. The following propaganda footage was discovered near an Acer factory, allowing us our first glimpse at the Predator X27’s capabilities. 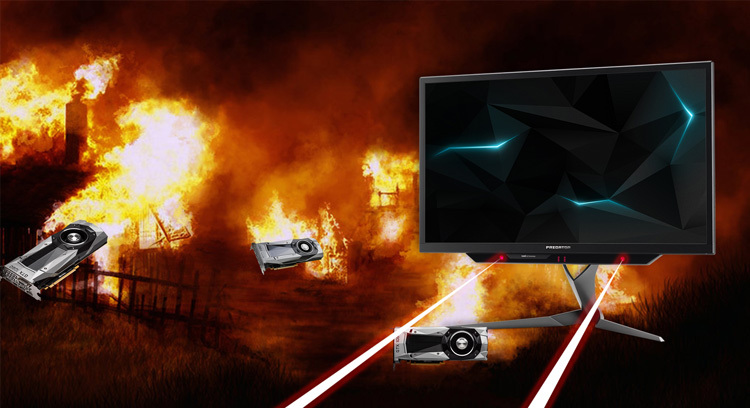 The Monitor People are set for a terrifying offensive with their new ocular weapon, but at the moment it’s unclear when the X27 will actually be unleashed. Some say this autumn, while others insist it will be later. Either way, the Graphics Card People are expecting the X27 to exist in small numbers due to their high cost, thought to be near £2000. That will be of some benefit to gamers who aren’t able to handle the Predator X27 upon release; perhaps by the time the X27 and its 4K 144Hz ilk are prevalent, the Graphics Card People will have an answer for them. Of course, Acer aren’t the only ones producing 4K 144Hz monitors. 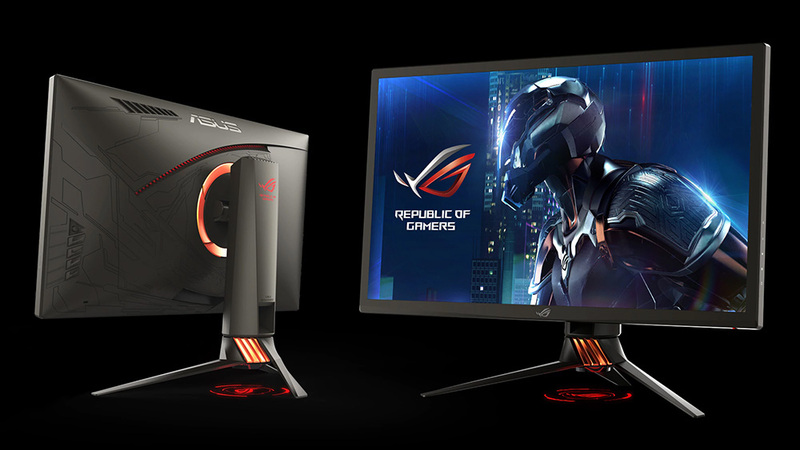 Asus have also vowed to deliver their own version of this dizzying new weapon, called the ROG Swift PG27UQ. GCP intelligence indicates that this monitor will have the same display panel and specifications, but a different look and a few unique features. The cosmetic differences will be just that, and both monitors should prove equally capable of bringing even a GTX 1080 TI to its knees. 4K at 144 Hz… the Graphics Card People knew this day would come. But they were not ready. There are whispers of graphics cards on the horizon, with code names like Vega and Volta, that might be able to stand up to this new foe. Perhaps two GTX 1080 cards could be run together to meet the challenge. But right now, the Monitor People reign supreme, as the Predator X27 stands atop a pile of burnt out GPUs, overclocked in vain.